If you’ve made the decision to improve your smile with Invisalign , then you’re probably curious about what the adjustment period will be like. Most people who use Invisalign find the aligners to be comfortable and easy to wear—much less obtrusive than traditional metal braces. As you begin your journey to a new smile, here is what you can expect during your first week of Invisalign treatment. When the aligners are first snapped onto your teeth by your dentist, you may notice that they feel a little snug. They have to fit your teeth tightly in order to make the shifts that are required for your treatment plan and to ensure that they don’t move when you speak. Although patients often describe noticing the snugness at first, the sensation tends to go away very quickly. Within a few hours, you likely won’t even notice that they are there. When you speak, you’ll feel the aligners at first, so you may feel like your speech is changing or that you are lisping. This temporary effect also goes away very quickly, once you become used to the sensation of the trays and how it feels when your tongue touches them when you talk. It’s normal to feel self-conscious about the way you’re speaking at first, but soon it will feel completely natural and you’ll feel like you’ve reverted to your normal speech. Once of the benefits of Invisalign is that you remove the aligners when you eat, so you don’t have to worry about avoiding certain foods or staining the trays. At first, it may be challenging to remove the aligners, but soon the technique will be second nature. As you adjust, the biggest challenge may be remembering to remove them, since you’ll forget they are there. At Glenwood Premier Dental, we’ll walk you through each step of the Invisalign treatment process, so you can focus on getting a smile you’ll love to show off. 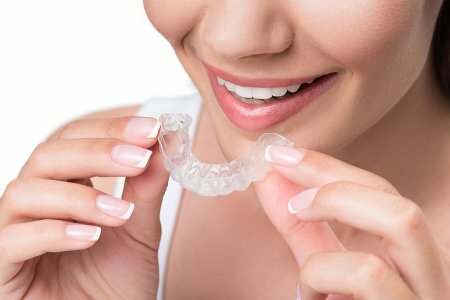 Could Invisalign be right for you? Schedule an appointment with one of our dentists in Hazlet today by calling (732) 264-4477.